Programmes of higher education in the European Higher Education Area (EHEA) are offered at three levels - undergraduate, graduate and doctoral studies - which are usually referred to as the three cycle system. Before the Bologna process had started, a huge variety of national higher education degrees existed across Europe. With increasing mobility of students, more and more problems for recognition did arise. In June 1999, 29 European countries agreed with the Bologna Declaration on the main goals of the Bologna process. One of the central aims was to establish a common structure of easily readable and comparable degrees in European higher education. For this purpose, all countries conveyed their national systems to a two cycle structure consisting of a first (undergraduate) and a second (graduate) cycle. 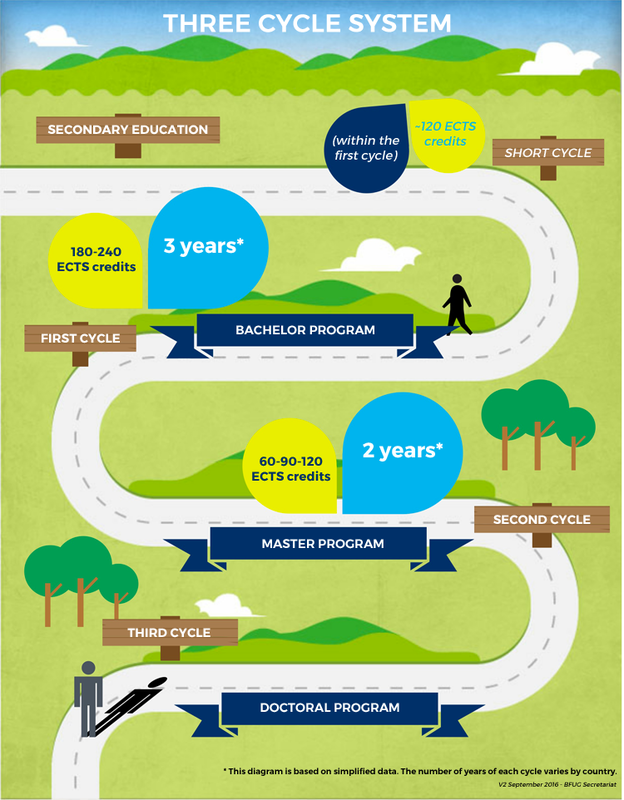 The first cycle leads to a qualification (in many countries labelled Bachelor”) which is obtained after successful completion of a study programme with 180 – 240 ECTS credits. Programmes of the first cycle last typically three years. The second cycle leads to a qualification (in many countries labelled Master”) which is obtained after successful completion of a study programme with 60 – 120 ECTS credits. These ranges for undergraduate and graduate programmes have been defined with the development of the Framework of Qualifications for the European Higher Education Area. Like the degree structure it should cater for comparable and transferable qualifications and facilitate mobility and recognition irrespective where and how learning outcomes have been achieved. European and national qualifications frameworks are based on the European Credit Transfer and Accumulations System (ECTS) in terms of quality (learning outcomes) and quantity (workload). At the 2003 conference in Berlin, for the first time doctoral studies and synergies between the European Higher Education Area (EHEA) and the European Research Area (ERA) have been discussed. Whereas the Bologna Declaration referred to two cycles which include all programmes of tertiary education (“The second cycle should lead to the master and/or doctorate degree as in many European countries”), the 2003 Berlin Ministerial Communiqué consequently defined doctoral programmes as the third cycle. Conscious of the need to promote closer links between the EHEA and the ERA in a Europe of Knowledge, and of the importance of research as an integral part of higher education across Europe, Ministers consider it necessary to go beyond the present focus on two main cycles of higher education to include the doctoral level as the third cycle in the Bologna Process. As the first and second cycle, the third cycle is described with the Dublin Descriptors. However, no credits or range of credits have been assigned to it. Generally, in the framework of the Bologna process doctoral studies are referred to as the third cycle. The European Higher Education Area is structured around three cycles, where each level has the function of preparing the student for the labour market, for further competence building and for active citizenship. the status of the doctoral candidate (student, employee, researcher). Especially in countries and/or disciplines where traditionally free individual research dominates the doctoral phase, the individuals carrying out these projects are not regarded as students but as early stage researchers/young professionals. At the same time, occasionally it is doubted that in fully taught doctoral programmes original research remains the essence of the doctorate. In Europe, the core element of doctoral studies in almost all disciplines for centuries had to be self-contained research including a scientific dissertation. However, with influences from overseas, a range of innovative doctoral programmes have been emerging in response to the changes in society and to challenges of a global labour market. The core component of doctoral training is the advancement of knowledge through original research. At the same time it is recognised that doctoral training must increasingly meet the needs of an employment market that is wider than academia. For all three cycles it is important to remember that the variety of programmes mirrors the diversity of higher education in Europe. However, readable and comparable degrees do not necessarily include equivalency of learning outcomes of all qualifications at the same level.